The Oregon Trail is now available for Wii and Nintendo 3DS thanks to RedWagon Games and DoubleTap Games. 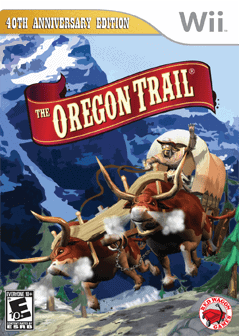 Set in the mid-1800s, The Oregon Trail lets players assume the role of a wagon pioneer leader guiding a party of settlers westward across 2,000 miles of winding, rough terrain from Independence, Missouri, to Oregon City on the Oregon Trail. The classic game has now been modernized for all ages on Wii™ and Nintendo 3DS™ and is part of the frenzy of nostalgia over the game, which has yielded everything from band tour promotions (“Fall Out Boy Trail”) to humorous references on popular websites (“Digg has broken an axle”). Since 1971, more than 65 million copies of the highly popular game have been sold. The single-player game retraces the historical journey, challenging the gamer to survive and prosper through four unique storylines with three different time periods. Plan and stock up for the dangerous trip, complete a variety of timed challenges including hunting and fishing, and unlock special items along the way. The Oregon Trail on Wii and Nintendo 3DS is the first version of the game where players can drive the wagon on the trail. The Oregon Trail was created in 1971 by three student teachers at Carleton College in Northfield, Minn., and immediately became popular throughout Minneapolis public schools. Since that time, the game has gone through a number of editions on a variety of platforms, including Apple II, Macintosh, DOS, Windows and iPhone/iPod Touch. Today, The Oregon Trail legacy is nurtured by The Learning Company, a division of global education leader Houghton Mifflin Harcourt. You can purchase at retailers that carry Nintendo DS and Wii games or Amazon. One reader will win The Oregon Trail for Wii! IMPORTANT: Please leave your entries above using the Rafflecopter form. Comments do not count as entries. If you are having issues with the form please leave me a comment here. It’s a new software and feedback is appreciated! I would give this game to my cousin since she has a Wii and I don’t. I loved playing the Oregon Trail game on the computer when I was younger! id keep it. i LOVE oregon trail!! I would give this game to my grandkids. My daughters would love this game! I would give this to my kids! If I won, I’d give this game to my kids. I’m going to totally selfish and give this to me. I used to play this game on our first Apple computer…lol. I bet that was at least 20 years ago. I loved this game! I absolutely LOVED this game when I was younger. I’d play it myself and share with my niece and nephew! This game would be for our entire family (me, hubby and our 2 boys). This game would be for my family (my husband, daughter and myself). I remember playing this in elementary school! I would give it to my 7 year old. But I want to play it myself. This would be a fun one for my grandchildren since I don’t own a wii and they do! our kids would enjoy playing it! I would keep this game for myself at first anyway. I used to love oregon trail when I was a kid so I want to play this new version. I would love to win this for my daughter, thanks! I’d give this to my daughter – I bet she’d love it as much as I did at her age! I would give it to my kids but would probably play it just as much as them. I would give this to my granddaughters. I would love this for my whole family. I would give this game to my son. This game is perfect for both of my kids! I’d give this to my sister, she loves this game!